Any reservations for girls in AIEEE? Minimum marks or Rank required? sir are girls having reservations to through aieee if so then what will be the minimum ranks or marks may i get to know? Minimum marks required for qualifying AIEEE in each subject? Minimum rank required in AIEEE to get into Thapar for Civil Engineering? Rank required in AIEEE and the minimum marks in NATA to get admission in B.Arch in PEC? Minimum marks required to get all India rank between 5000-8000 in general category in AIEEE? Minimum marks required in AIEEE to take admission in Civil Engineering in Thapar college? In aieee, what are the minimum marks reqiured in each subject? Minimum rank to enter NIT for girls through AIEEE? Minimum rank required in AIEEE through which I can get admission in private colleges of Pune and Bangalore? Can I get into NIT Warangal after scoring 200 marks in AIEEE? Minimum marks required to achieve a rank in AIEEE for doing Aeronautical Engineering from reputed institute in India? Is there any girls quota in NIT after scoring 121 marks in AIEEE? For SC quota what is the minimum marks required in AIEEE to take admission in NITs? Minimum marks required to get admission in NITs? How much marks required to get rank under 5000? What is the use of reservation in society? Re: Any reservations for girls in AIEEE? Minimum marks or Rank required? Well there is no such reservation there in any of NITs or IIITs. You can expect reservation only if you belongs to any reserved category namely SC/ST, OBC, PH and CW. 27% seats are reserved for OBC. But only for OBC candidates who belongs to Non Creamy Layer. (Non Creamy Layer): Constitutionally, previously the OBC candidates having Annual Income less then 2.5 Lacs are considered to be OBC Non-Creamy layer. But since the criteria has changed to 4.5 Lacs so all OBC candidate (father-Mother) having annual income less then 4.5 Lacs per annum will be considered under Non-Creamy Layer. In brief Parents Income (except salary and income from agricultural land) must not exceed 4.5 Lacs in last 3 consecutive years. 3% Seats are reserved for PH candidates, provided that they have at least 40% of disability. 5% seats are reserved for CW. Children/War Widows of Defence Personnel of personnel of Armed/Paramilitary Force. There is no female reservation in AIEEE exam. If you get below 2000 rank,then you can get admission in top Engineering college. but not in IIT'S AND NIT'S. 3% reservation for PH candidates. their is no such reservation for girls in AIEEE. it can give relaxations for casts only, not for gender. but many of state level universities are provinding with reservations for girls. sir, i want to know that after 7000 rank in IITJEE for general candidates,which college & what branches are offered? i am getting 55 marks and i am an sc can i hope any rank mfor me? My Uttarakhand State ST rank is 372. I am a girl can I get addmission in any NITs. Please suggest me , can i get any good Engg collece for Computer/ Electronic trad. Is their any reservation for girls & SC, ST students in AIPMT? No, there is no reservation for girls in AIEEE. Reservations for girls in AIEEE? There is no such reservation for girls candidates in AIEEE. As per the order of honorable supreme court, Reservation is given only to OBC, SC and ST candidates. ◘> Minimum marks required for counseling is 60 for general candidates, 50 for OBC, 43 for ST and 35 for ST candidates. There are no reservations for girls, you have to take your sit as a candidate, but SC/ST/OBC and physically challenged citizen will have reservation. I do'nt think there is any kind of reservation provided especially for girl, never the less, if you belongs to ST\SC\OBC candidates , then you can claim for the any kind of reservation for taking advantage of reservation in allotment of seats in NITS . i scored 101 marks i aieee can i get admisson in pec university of technology chandigarh? What minimum rank in AIEEE is required to get into nit colleges? There are no such specific reservations given to girls in AIEEE. 3% Seats are reserved for Physically Handicapped Candidates. Now , if you want to get admission in NITs , then you have to get a rank less than 17,000 and if you want to know the minimum marks required to be eligible to called for the counselling , then you must have to secure a minimum of 48 marks. -->no,my dear friend there is no individual quota for girls in NIIT'S and IIT'S. -->but reservation seats are there for categories like SC/OBC/ST. -->FURTHER PLEASE CHECK THE ATTACHED FILE. THANKS....ALL THE BEST....GO AHEAD AND WORK HARD TO GET ADMISSION I ONE OF THE BEST IIT'S BASED INSTITUTE. Currently , there is no reservation for Girl Candidate. However, if you belong to any of the category such as SC/ST/OBC/PH etc. then you can get a reserved seat. Here I have attached 2 files namely Reservation.pdf and Reservation2.pdf, you can find all details about reservation in these files. 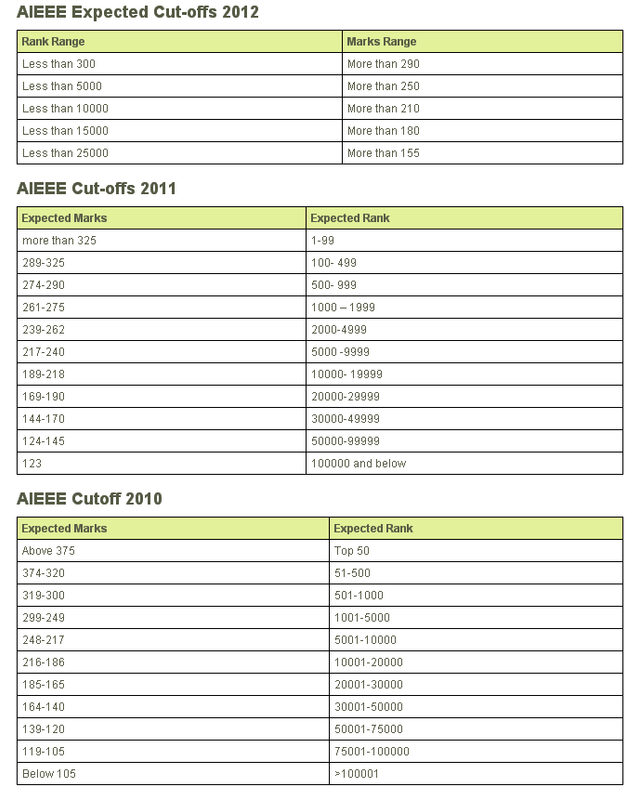 Coming to second part of your question, this is the list of expected marks vs rank in AIEEE. Please note that you can not assure what rank would you get in AIEEE 2013 but it's just for an Idea.